Oh HTC, thanks for sending that tweet on Wednesday (actually, it came from HTC's U.K. office). Yes, we got the point immediately about the 'little' bit of news that you are going to send our way on Thursday. In addition, the image of the phone in the pocket would at first blush appear to be the HTC One, but the placement of the black dot on the back is on the wrong side. 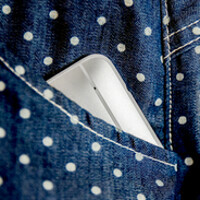 Plus, we get the idea of the phone fitting easily into a pocket. 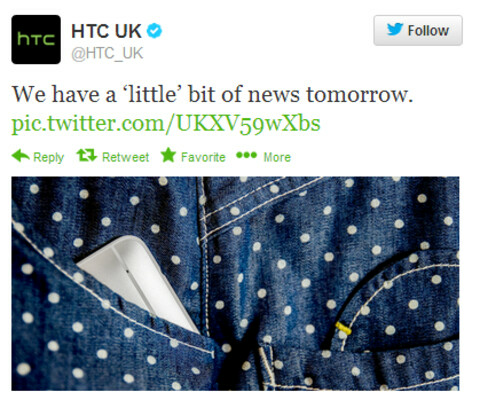 It all adds up to the unveiling on Thursday of the HTC One Mini. Earlier on Wednesday we showed you a leaked picture of the AT&T branded version of the phone, and also took the time to go over the specs on the handset. While those with small hands will appreciate the smaller screen and dimensions of the HTC One Mini, those who like things big will be awaiting the HTC Max. That unit is expected to feature a 6 inch LCD-3 display with a 1080 x 1920 FHD resolution, a quad-core 2.3GHz Snapdragon 800 processor, 2GB of RAM with a 3200mAh battery. That model is supposedly penciled in for a late September launch. For right now though, this is the HTC One Mini's time in the spotlight. Keep your eyes right here. I will be waiting for the Max.